512 Commercial Properties in Nt are listed in 6 categories. We have 227 Offices for Lease , 225 Industrial Warehouses for Lease , 45 Retail Shops for Lease , 20 Medical and Consulting Properties for Lease , 18 Showrooms for Lease and 6 Development Lands for Lease . Strata warehouse unit Building area 86 m2 Office 15.5 m2, tiled floor, air conditioned Rear yard security fenced area 31 m2 Masonry block construction Motorised roller door Kitchenette, combined shower toilet Parking at your door Excellent driveway access and turnaround for large vehicles, trailers ,caravans Available now For Lease: $1,400 + GST per month For more information, or to arrange an inspection, call Nick Syrimi today at Ray White Commercial (NT) Visit our website rwcnt.com.au to view all our property listings! Commercial warehouse with mezzanine office Building area 143 m2 ground level Mezzanine office 35.5m2 Mezzanine storage approx. 20 m2 Fully air conditioned throughout Masonry block construction Wide motorised roller door Shop front glazing 2 car parks on title Available now For Lease: $2,803 + GST per month View by appointment 7 days a week. For more information or to arrange an inspection, please call Nick Syrimi on 0412 537 638 at Ray White Commercial (NT) Visit our website www.rwcnt.com to view all our property listings! Tenancy building area approx 100 m2 Open plan tenancy Fully air conditioned with split system units High ceiling Shower toilet Ceramic tiled floors Car parking at your door Complex of 9 units Cnr Coonawarra Rd Mataram Street Available now View by Appointment 7 Days! For Lease: $1,400.00 + GST per month For more information, or to arrange an inspection, call Nick Syrimi today at Ray White Commercial (NT) Visit our website rwcnt.com.au to view all our property listings! Unit building area 97 m2 Security fenced rear yard area 39 m2 Masonry block construction Combined shower WC and kitchenette Motorised roller door front, manual operation at rear 1 car park + loading bay area on title Available to occupy now View by Appointment 7 Days! For Lease: $1,600.00 + GST per month For more information, or to arrange an inspection, call Nick Syrimi today on 0412 537 638 at Ray White Commercial (NT) Visit our website rwcnt.com.au to view all our property listings! Office area approx 39 m2 Portal framed, metal clad building 2x Wide sliding doors Secure rear yard approx 200 m2 Kitchenette, 2x Showers, 2x W.C Parking at your door Easy vehicle access Available now View by Appointment 7 Days! For Lease: $3,800.00 + GST per month For more information, or to arrange an inspection, call Nick Syrimi today at Ray White Commercial (NT) Visit our website rwcnt.com.au to view all our property listings! Tenancy building area approx 100 m2 Open plan tenancy with one partitioned office Fully air conditioned by ducted system High Ceiling Shower toilet Ceramic tiled floors Car parking at your door Complex of 9 units Cnr Coonawarra Rd Mataram Street Available now View by Appointment 7 Days! For Lease: $1,600.00 + GST per month For more information, or to arrange an inspection, call Nick Syrimi today at Ray White Commercial (NT) Visit our website rwcnt.com.au to view all our property listings! Unit building area 79 m2 Masonry block construction Combined shower W.C and kitchenette Motorised roller door 2 car parks + loading bay area on title Excellent Vehicle access Development complete and units available to Occupy View by Appointment 7 Days! For Lease: $1,295.00 + GST per month For more information, or to arrange an inspection, call Nick Syrimi today on 0412 537 638 at Ray White Commercial (NT) Visit our website rwcnt.com.au to view all our property listings! The perfect location for Business. Strata A Grade Office Suite within a landmark Commercial Centre in the heart of Parap. New strata A grade office Suite Office tenancy area 212.5 m2 Ground floor tenancy Ducted air conditioning system Amenities include kitchenette, W.C x 2 Qty 2 reserved under cover car parks on 1st level Customer common parking provided for the complex Available now View by Appointment! For Lease: $6,730 + GST per month For more information, or to arrange an inspection, call Nick Syrimi today at Ray White Commercial (NT) Visit our website rwcnt.com.au to view all our property listings! Strata warehouse unit Total ground level building area approx. 146 m2 2x partitioned offices, plus 1x air conditioned work room area approx. 108 m2 Storage area with roller door access area approx. 38 m2 Mezzanine storage area approx. 108 m2 Masonry block construction Shop front glazing Amenities kitchenette, plus 2x WC 3 metre wide motorised roller door at the rear 2 car parks on title Vacant Possession on settlement View by appointment during business hours For Lease: $2,535 + GST per month For more information, or to arrange an inspection, call Nick Syrimi today at Ray White Commercial (NT) Visit our website rwcnt.com.au to view all our property listings! Commercial unit fully air conditioned Tenancy area approx 175 m2 High ceiling Shower toilet Car parking at your door Street front unit facing Coonawarra Road Complex of 9 units Cnr Coonawarra Rd Mataram Street Available now View by Appointment 7 Days! For Lease: $2,200.00 + GST per month For more information, or to arrange an inspection, call Nick Syrimi today at Ray White Commercial (NT) Visit our website rwcnt.com.au to view all our property listings! Small warehouse with office Warehouse 44 m2 in building area Office area amenities area approx. 20 m2 Storage area approx. 24 m2 Combined shower and W.C Kitchenette Wide motorised roller door 1 car park on title View by Appointment 7 Days! For Lease: $900 + GST per month For more information, or to arrange an inspection, call Nick Syrimi today at Ray White Commercial (NT) Visit our website rwcnt.com.au to view all our property listings! This centrally located property offers the astute Operator an incredible chance to occupy an affordable, tidy building within an industrial complex in Winnellie. Featuring a high clearance warehouse (approx. 152m2) a clean modern office with air conditioning (approx. 25m2) and offers everything that you could possibly require including amenities, 3 phase power and rear yard. The complex is also designed to allow good trucking / vehicle access for deliveries etc. as required. Take the chance to discuss this outstanding leasing opportunity!! Available July 2019. A great opportunity to lease this affordable Winnellie warehouse of 91m2. The end unit it is of block construction accessed by front roller door. The complex is also designed to allow good trucking/vehicle access for deliveries etc. as required. Perfectly positioned in the main commercial / Industrial suburb of Winnellie. Warehouse unit area 324 m2 Includes office area of 28 m2 Secure rear yard Wide roller doors front and rear Amenities bathroom with W.C and shower combined Complex of two industrial units Unit entitlement area 608 m2 Zoning Li light Industry Available for immediate occupancy View by Appointment 7 Days! For Lease: $3,150 + GST per month For more information, or to arrange an inspection, call Nick Syrimi today at Ray White Commercial (NT) Visit our website rwcnt.com.au to view all our property listings! Office unit area 79 m2 approx Fully fitted out to include An open plan front office area 1x partitioned boardroom 1x partitioned office approx Kitchenette Ducted air conditioning system Disabled toilet, showers, men's and ladies toilets are common use for tenants 2 car parks directly in front of the premises Public transport bus stop on the street in front of the unit Occupancy Available now View by Appointment 7 Days! For Lease: $2,305.00 + GST per month For more information, or to arrange an inspection, call Nick Syrimi today at Ray White Commercial (NT) Visit our website rwcnt.com.au to view all our property listings! Small stand alone office/shop Strata Commercial unit 100 m2 Building area 75 m2 and front verandah area of 25 m2 Car parking directly in front of the premises Kitchenette Ceramic tiled floors 1x W.C Ready to occupy All uses considered View by Appointment 7 Days! For Lease: $1,550 + GST per month For more information, or to arrange an inspection, call Nick Syrimi today at Ray White Commercial (NT) Visit our website rwcnt.com.au to view all our property listings! First floor tenancy Building area approx. 105 m2 2 undercover car parks Floor coverings carpet Fully air conditioned Glazing/sliding windows to both sides New kitchenette to be installed 1 x WC Workstations installed and networked Server in place Office furniture included for tenants use or removed as required Excellent presentation Central location minutes from the CBD Available for immediate occupancy View by Appointment 7 Days! For Lease: $1,750.00 + GST per month For more information, or to arrange an inspection, call Nick Syrimi today at Ray White Commercial (NT) Visit our website rwcnt.com.au to view all our property listings! Rear unit in Complex of two industrial factory units Building area approx. 435 m2 Internal office area approx. 25 m2 2x5 metre wide motorised roller doors (front) 2x5 metre wide motorised roller doors (rear) Concrete slab 30 metres x 5 metres at rear of the property Disabled toilet + shower combined, plus sink unit Security fenced 1,800 mm high chain mesh around the property perimeter Dedicated parking area Available now View by Appointment 7 Days! For Lease: $3,600.00 + GST per month For more information, or to arrange an inspection, call Nick Syrimi today at Ray White Commercial (NT) Visit our website rwcnt.com.au to view all our property listings! Unit total building area 197 m2 Warehouse area 135 m2 Including office area approx. 62 m2 Divided as 3 office areas Wide sliding door to warehouse Kitchenette, 1 x W.C Complex has dual driveway access Excellent truck access and ample on site parking Available to occupy late November View by Appointment 7 Days! For Lease: $2,100.00 + GST per month For more information, or to arrange an inspection, call Nick Syrimi today at Ray White Commercial (NT) Visit our website rwcnt.com.au to view all our property listings! Total building area approx. 488 m2 Construction : Portal steel frame with metal cladding Street exposure to Tivendale Road The property is in excellent condition throughout. Warehouse area approx. 400 m2 Office area approx. 88 m2 Carport for 4 car bays directly in front of the office Further common parking at rear Property features: Office area fully fitted out Reception area plus 3 partitioned offices Staff room with kitchenette 1 x W.C Warehouse area clear span Wide motorised roller door 1 x disabled W.C + shower combined Available to Occupy now View by Appointment 7 Days! $54,000 + GST per annum For more information, or to arrange an inspection, call Nick Syrimi today at Ray White Commercial (NT) Visit our website rwcnt.com.au to view all our property listings! Strata unit building area approx. 109 m2 Ground floor Glazing to shop front Kitchenette plus 1x W.C Open plan fit out ready to occupy Ceiling mounted cassette air conditioning units Floor coverings carpet tiles 2 car parks on title Designated customer parking throughout the complex New commercial complex Available now View by Appointment 7 Days! THIS PROPERTY HAS BEEN LEASED BY RAY WHITE COMMERCIAL (NT) For more information, or to arrange an inspection, call Nick Syrimi today at Ray White Commercial (NT) Visit our website rwcnt.com.au to view all our property listings! New strata office unit First floor tenancy Building area approx. 98 m2 Open plan fit out ready to occupy 2 ceiling cassette air conditioners Floor coverings carpet tiles Amenities kitchenette, plus W.C. 2 car parks on title Lift provided to building Designated customer parking throughout the complex View by Appointment 7 Days! For Lease: $2,042.00 + GST per month For more information, or to arrange an inspection, call Nick Syrimi today at Ray White Commercial (NT) Visit our website rwcnt.com.au to view all our property listings! Warehouse area 56 m2 Electric roller doors front Shower + toilet combined Kitchenette 1 car parks allocated Commercial Complex in Winnellie just past the Showgrounds Available mid May 2019 View by Appointment 7 Days! For Lease: $850.00 + GST per month For more information, or to arrange an inspection, call Nick Syrimi today at Ray White Commercial (NT) Visit our website rwcnt.com.au to view all our property listings! Warehouse unit with mezzanine office Total building area approx. 95m2 Mezzanine office approx. 21m2 Rear yard approx. 32m2 Undercover car park Motorised roller doors front and back Shower + toilet combined Kitchenette View by Appointment 7 Days! For Lease: $1,700.00 + GST per month For more information, or to arrange an inspection, call Nick Syrimi today at Ray White Commercial (NT) Visit our website rwcnt.com.au to view all our property listings! Tenancy 32m2 Ground level tenancy area 32m2 Full glazing to the shop front Set up and furnished as a Hair Salon including Reception counter 4x cutting stations with chairs 2x wash basins Separate small room with sink storage cupboards Vinyl flooring Occupy with minimal expense Suit owner operator Available for immediate occupancy View by Appointment 7 Days! For Lease: $1,600.00 + GST per month For more information, or to arrange an inspection, call Nick Syrimi today at Ray White Commercial (NT) Visit our website rwcnt.com.au to view all our property listings! Building 1 Warehouse 490 m2 Plus 127 m2 office area fitted out Qty 3 roller doors High amps 3 phase power large water main 300 mm drains to each side of the warehouse Building 2 Warehouse 405 m2 4 roller doors Paved yard area 400 m2 12 car parks Awning between buildings Bituminised drive through with dual street access Security fenced around the perimeter Zoned DWNI2 General Industry Total land area 3390 m2 View by Appointment 7 Days! For Lease: $80,000 + GST per annum For more information, or to arrange an inspection, call Nick Syrimi today at Ray White Commercial (NT) Visit our website rwcnt.com.au to view all our property listings! Unit building area 230 m2 Extensively fitted out with partitioned offices Reception + 2 interview rooms, board room, 2 offices 2 large open plan work areas 9.4 x 4.5 mtrs and 7.2 x 6 mtrs Kitchenette, bathroom Small storage area at rear Rear yard area approx. 88 m2 Security system installed Ex Real Estate office High exposure strata commercial complex Well maintained complex of 5 commercial units Available now View by Appointment 7 Days! For Lease: $2,600.00 + GST per month For more information, or to arrange an inspection, call Nick Syrimi today at Ray White Commercial (NT) Visit our website rwcnt.com.au to view all our property listings! Shop tenancy area 96 m2 Direct frontage to The Mall Qty 1 secure car park included Facilities are in place for water, waste, grease trap, gas and ducting for range hood All enquiries considered Adjoining shop of 79 m2 is also available to combine as one tenancy area of 175 m2 should a larger tenancy be required View by Appointment 7 Days! For Lease: $43,200.00 + GST per annum For more information, or to arrange an inspection, call Nick Syrimi today at Ray White Commercial (NT) Visit our website rwcnt.com.au to view all our property listings! 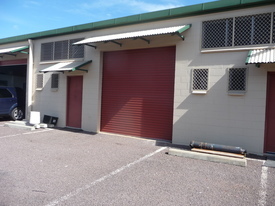 Storage Unit - Winnellie $250.00 per month GST exc..
Unit building area approx. 18.5 m2 Masonry block construction Roller door access to unit Clean, tidy and presents as new Secure remote gate access to complex 24 hrs Care Taker on premises Available to occupy now Only six minutes drive from the Darwin CBD View by Appointment 7 Days! For Lease: $250.00 + per month For more information, or to arrange an inspection, call Nick Syrimi today at Ray White Commercial (NT) Visit our website rwcnt.com.au to view all our property listings! Yarrawonga Village is located on the southbound artery of the Stuart Highway and in very close proximity to Palmerston Shopping Precinct, Palmerston suburbs and Yarrawonga industrial area. The Village offers easy access for tenants, suppliers and customers with ample car parking... Shops 3 4 total tenancy area 269 m2 Fully Air conditioned showroom 169 m2 Storage area 100 m2 with 2 motorised roller doors Plate glass shop front Ceramic tiled floors T bar ceilings with recessed lighting Kitchenette, 1 x W.C (disabled) Direct Stuart Highway frontage with high traffic flow Fantastic exposure for any type of business All tenancy uses considered View by Appointment 7 Days! For Lease: $4,870.17 + GST per month For more information, or to arrange an inspection, call Nick Syrimi today at Ray White Commercial (NT) Visit our website rwcnt.com.au to view all our property listings!